Well done to all the rowers and thank you so much Ray Coyte for raising so much money for the charity. Rays justgiving page is still happy to receive donations please go to our Donate page and go to raise money and you will see Rays page. 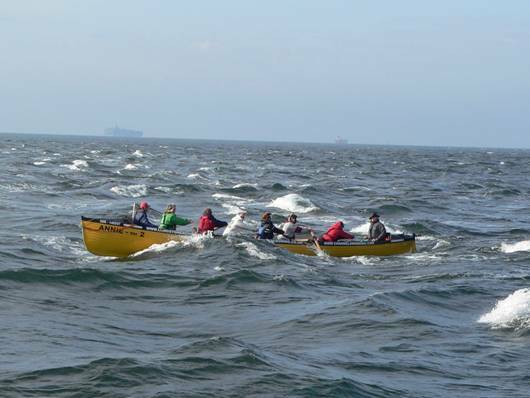 “To all the 43 lovely people who generously sponsored me to row across the English Channel. This is a personal email to thank you all. After a number of delays due to poor weather conditions we finally got clearance to attempt the crossing yesterday morning. We set off from Dover at just after 6am. 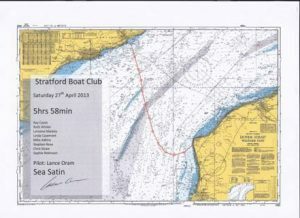 The weather conditions were perfect with a flat sea, clear skies and only a slight wind. The boat felt very heavy and slow to begin with and it seemed to take ages to get away from the coast. At times it felt as if the tide was just holding us back. There was a lot of shipping around us mid channel and at one point we had to make an alteration of course to steer around and behind a West bound ship. Up close you realise how fast they travel and how slow we were. Rowing in heavy waterproofs and lifejackets was horrible and after a few hours we were all beginning to wonder if this was a good idea. The sea started to build up just before the half way point and at times we found ourselves in some very choppy water that was throwing the boat all over the place. We found it hard to row through the rough water as we just could not settle into a steady rhythm and every time the boat hit a wave it slowed us right down. It was never overly dangerous but we did get the odd wave slop over the side. As you can imagine the problem was that you either had an immensely heavy oar to pull on, or the oar was just missing the water completely. We all got a big boost when we passed the mid channel marker. Approaching the French coast was tough as it just seemed to take ages. The sea started to get really rough off Cap Gris-Nez and we really struggled to finish the row off. We did it though, and we were very pleased with a respectable 5 hours 58 minutes. Feeling a bit stiff at the moment but not too bad ! It was your generosity that kept me going during the row and I am very grateful to you for being so supportive. You have helped me raise £1,945 (so far) for Shipston Home Nursing – and I am chuffed to bits! Thank you again – it was good of you to dig into your own pocket and I appreciate it.